Flatfish, known as "flatties" by sea anglers, are a pleasure to catch and a treat to eat. There are three common flatfish that live in the coastal waters of the British Isles: dab, flounder and plaice. Each species of flatfish live, hunt and feed on the seabed. Their flat shape and sandy coloured skin make ideal camouflage for their habitat. "Flatties" have both eyes on the upper side of the body so that when hidden, in sand or mud, they have all round vision. The smallest member of the flatfish family is the dab. The average length is about 15cms. and any fish over 30cms. is considered a specimen. The flounder is larger than the dab and fish of about 1kg. are common. There are raised spots and orange blotches on the back of the flounder that stretch from head to tail. Largest of all common flatfish is the plaice. However, they do not grow to monster size and a fish of about 1.5kg. is a good catch. Dab and flounder are caught close in shore and most frequently in estuaries and shallow creeks. Occasionally, flounder will swim so far up an estuary that, sometimes, they will be caught by freshwater anglers out for a day's chub and roach fishing! Some wide estuaries will hold plaice but usually this fish is located in open water especially where there are established mussel beds. Flatfish can be caught from beach, pier and boat and the experienced angler will use specialist equipment to suit each location. For the angler new to sea fishing it is sensible to choose a general-purpose sea rod. These kinds of rods are less than 4 metres long, they will not be too expensive, and can be used from beach, pier or boat. Some sea anglers use multiplier reels and they are very effective. However, multiplier reels, when used by novices, have a tendency to overrun and the result can be a knotty tangle of line! Fixed-spool reels are popular because they are easy to use and strong enough to cope with most situations. Fit the reel with line of about 20lbs. breaking strain. This strength of line will easily manage any flatfish but will also deal with snags, such as seaweed and stones, on the seabed. Float fishing from piers, harbour walls and jetties account for good catches of dab and flounder. Use a brightly coloured float so that it can be spotted at distance or in the swell of the tide. Legering from beaches and boats will take flatfish. Try a bomb type leger weighing about 50-100gms. and this will be big enough to hold bait down but not too heavy for casting. There is an interesting method used by a few people of catching flatfish without having rod, reel or even bait! Occasionally, in shallow estuaries at low tide, people venture out into the water and walk back and forth holding a large net. 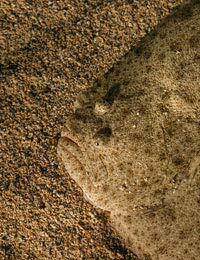 Flatfish hiding in the sand and mud are disturbed and are quickly scooped up in the net. This method requires years of practice and is not totally safe so stick with a rod and reel! The natural diet of "flatties" consists of worms, small crabs and shellfish such as mussels and cockles. If you have the time, you can collect all the bait you need at low tide and it's free! Use a garden fork to dig in the wet sand near the water's edge for lugworm and ragworm. Check out harbour walls and pier supports for shellfish and crabs. Bait can be bought from tackle shops but it can be expensive especially when it's fresh. Using artificial bait called spoons will also catch flounder and plaice. When the spoon is pulled through the water it resembles a small vulnerable fish and will attract inquisitive predators. Mussels and cockles can slide off the hook because the flesh is soft. Wind thin cotton around the bait to secure it to the hook. Dab have tiny mouths so keep the bait and hook small. Peeler crab, found in estuaries at low tide, is one of the most popular baits. They are called peeler crab because they shed skin during various stages of growth. Flatfish make a tasty meal. Try covering lightly with flour and fry quickly in hot oil. I have had some success using minnows as live bait for chub,I attach a 16-18s hook for the minnow and a 12-14s hook for the chub,both attached to the same line and float fished.Whenthe minnow is caught on the small hook I transfer it immediately to the larger hook by passing the hook thro' from under the mouth thro' the mouth and out above the mouth,the minnow stay alive for quite a while.I use the same float and let the minnow swim freely,towing the float. Of course one cannot transfer minnows from one venue to another by law. I also use a bucket aerator and have a few ready to live bait with. I always use lightweight braid on my reel line,with the end tackle in mono,it makes the bite contact a lot more positive and it enables me to feel what the fish is behaving like in terms of runs etc.